“The Dragon’s Path”, the first book in Daniel Abraham’s epic fantasy series, was a reasonably good book but one I found a bit disappointing since it didn’t quite live up to the high standards set by his previous series, the “Long Price Quartet”. In his previous series each book had been an improvement on the previous one so I was hoping for something similar with this series, and the second book is indeed a significant improvement on the first. One of the best things about the first book was the characterisation and the main characters do continue to develop here. Geder continues to be the most distinctive character and here he makes further steps along his path from bullied young nobleman to tyrannical despot and Abraham does a good job of switching between scenes where he seems like a sympathetic character to scenes where it is clear that his lack of empathy for the consequences of his actions is turning him into a monster. Dawson is the character who is pretty much Geder’s polar opposite, a generally unlikeable character with bigoted ultra-conservative opinions who is also admirable for his willingness to stand up for what he believes is right. Dawson’s wife Clara was one of the more interesting minor characters in the first book and she gets an expanded role in this book, where she is a good example of how to write a strong and powerful character in a militaristic society who is not a warrior. The storyline involving those three characters is the most interesting in the book, particularly as a power struggle gradually developed between Geder and Dawson, and it is more interesting than any of the plotlines in the first book. Some of the scenes in which Geder confronts the people he believes to be his enemies are particularly tense, and the big confrontation between Dawson and Geder is one of the most memorable scenes in the book. Cithrin was perhaps the most interesting character in the first book but she has one of the weaker story arcs in this book since her plotline does seem excessively contrived at times, as she gets involved in the main plotline of the book and largely abandons the plotline about her setting up her bank branch that had formed most of her story in the first book. Some of her interactions with Geder feel a bit unbelievable in terms of her characterisation, in particular her surprisingly muted reaction to one revelation about his past deeds. Marcus doesn’t get much to do in the early part of the book and it’s a bit surprising how foolish he is in some of his decision-making. In the second half of the book he sets off on a quest which seems likely to be relevant to the overall story arc of the series, but it does feel a bit disconnected from the rest of this book. The world-building is reasonably good but it continues to be slightly frustrating that although the dozen different races of humanity form a major part of the background the main characters are almost all from the same race and the races feel like background detail rather than an important part of the world. While the Long Price Quartet had a very distinctive setting, this world does continue to feel like a fairly generic epic fantasy setting, although there is still a lot of potential for it to be developed further in later books in the series. 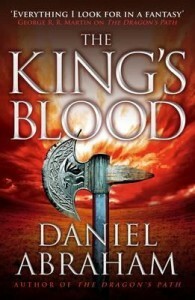 In summary, this is a good improvement on the first book and if there are further improvements in later books then this might eventually be ranked among the best of the current Epic Fantasy series.